Ravelry is an awesome resource for crocheters and knitters, especially when it comes to free patterns. I recently made a dress following this pattern, and while it is really pretty, I am not particularly fond of the silhouette for my girls. So I took only the skirt part of the pattern, and crocheted a bunch of lace skirts! I think the skirt definitely needs a slip or petticoat under it (because of all those holes), but I really like the effect! I think the skirt came out very feminine and delicate looking. This is Marina’s Valentine’s Day themed outfit! She is wearing Stella Savannah’s stock blouse, a white slip skirt underneath the red crocheted skirt I made, white socks, and Les Jeunette stock high heel booties. I think the skirt goes really well with her red lips, and I think Marina might be too cool for pink. Follow the pattern for the skirt as directed. Cast on as directed, making 25 single crochets (I work in US terms), which is the start of the waistband part. Follow Row 5 – 7 to complete the waistband. When I completed the last row of the waistband, instead of casting off, I turned my work and extended the waist band part length-wise to make room for a snap. (See “Back Button Flap” part of the pattern). Finish the skirt as directed. The skirt works up pretty easy and quickly! Also, don’t forget that the pattern is in UK terms!! Disclaimer – The original pattern is not mine. It is called “Blythe Crochet Dress Pattern” by Sarah Youde. I simply altered it slightly to meet my needs. My intention was to make a cowl that could be pulled over the head and used as a hood. I wanted to try the trinity stitch, and winter is coming, so I thought a cowl hood would be perfect. 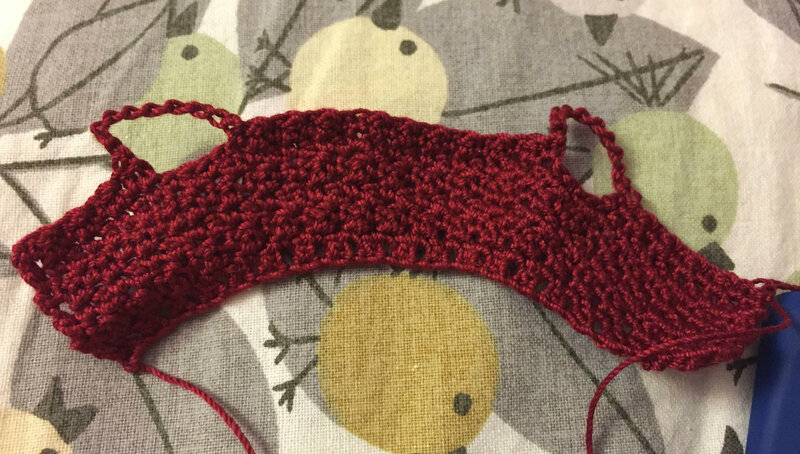 The Trinity stitch is very easy! 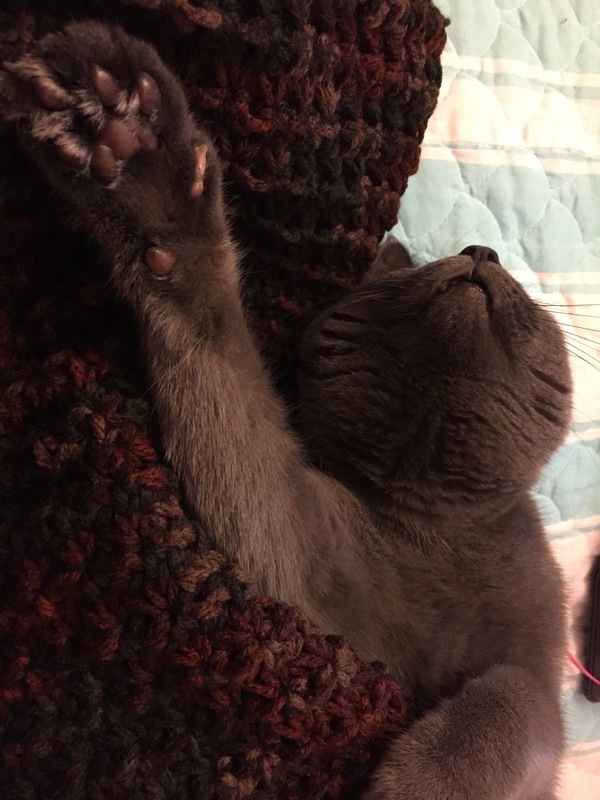 Your starting stitch must be a multiple of 4. 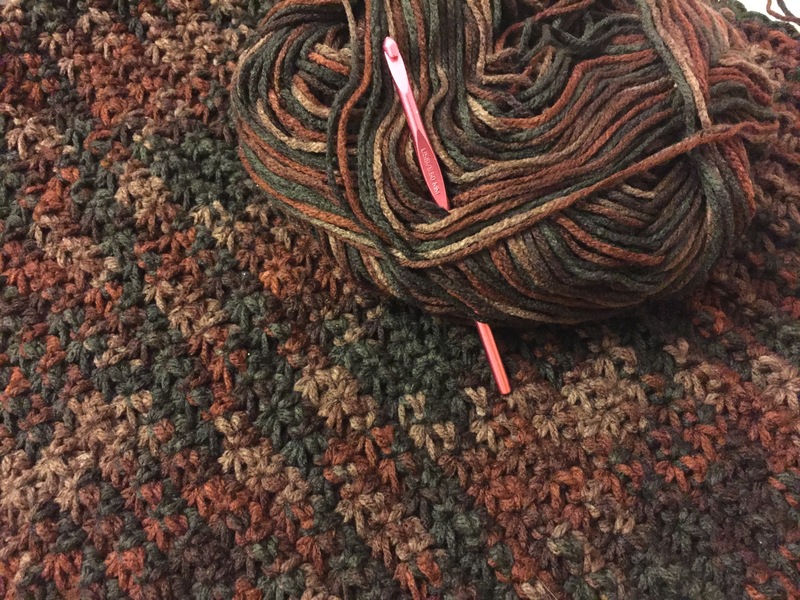 Skip the first chain and Single crochet into chain 2. Then, you do a Single Crochet 3 Together using chain 2, 3, and 4. Chain one. Single crochet 3 together using chain 4, 5, and 6. Chain one. You keep doing SC3tog working into the stitch your last SC3tog ended on, and then you chain one. When you get to the last stitch, don’t chain 1 after the sc3tog. Instead, you single crochet into the last stitch. Chain two and turn. I hope my explanation was clear. If not, I really like New Stitch a Day for looking up new stitches. 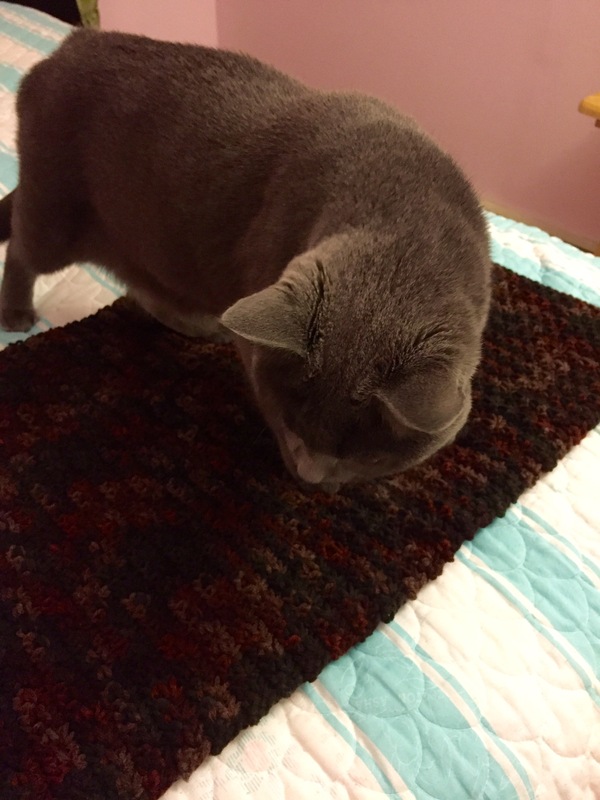 Sooooo, I kind of made the cowl too wide and my cat took a keen interest in what I was crocheting. 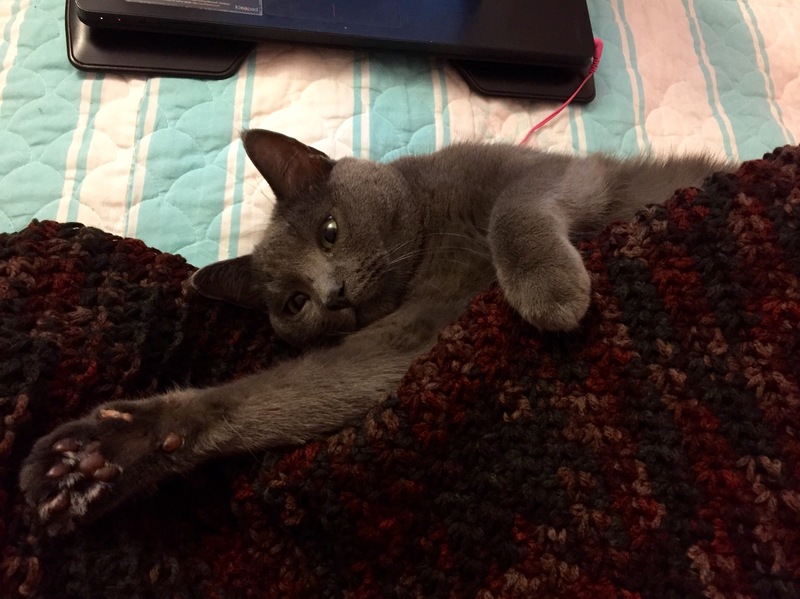 I ended up making a mat/blanky for my kitty ^^. I really like trying new stitches! The trinity stitch was very easy once I got the hang of it. This stitch also has an interesting texture, and I was happy with the way the multicolored yarn made sort of a pattern of colors. 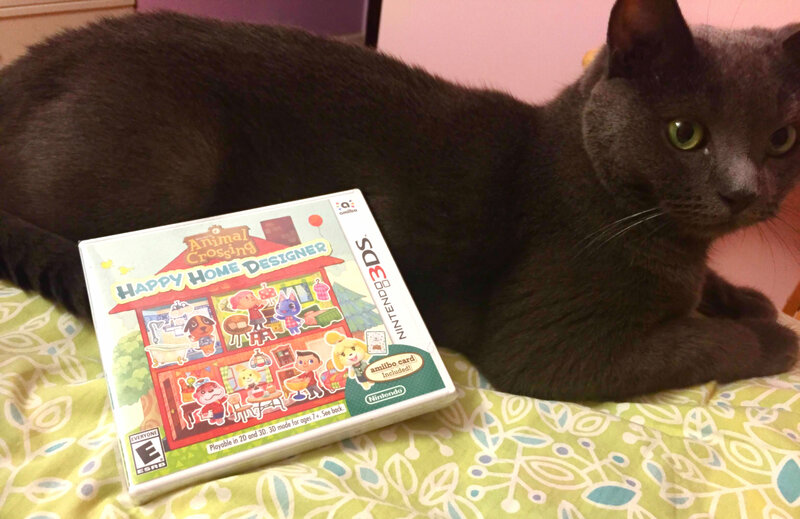 I hope it keeps my baby warm during the winter ^^. I exaggerate when I say “protips.” I hope I haven’t raised any expectations too high >_<. 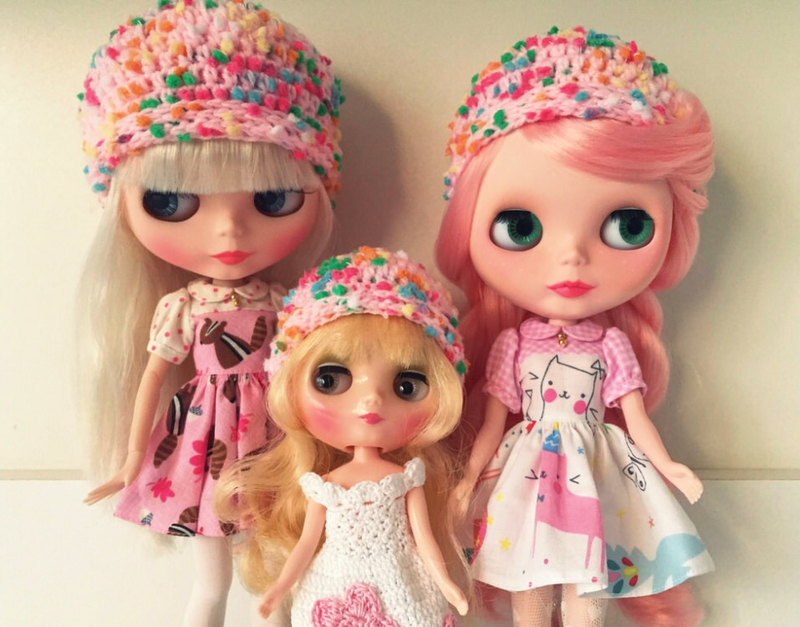 I’ve said many times before that I really enjoy crocheting for my dolls, particularly hats! They make for quick projects, and unless I am trying out a new pattern, I can make the doll hat by memory. There are many resources for crochet patterns for dolls, but even so, sometimes it’s hard to find a pattern for exactly what you are looking for in a hat. 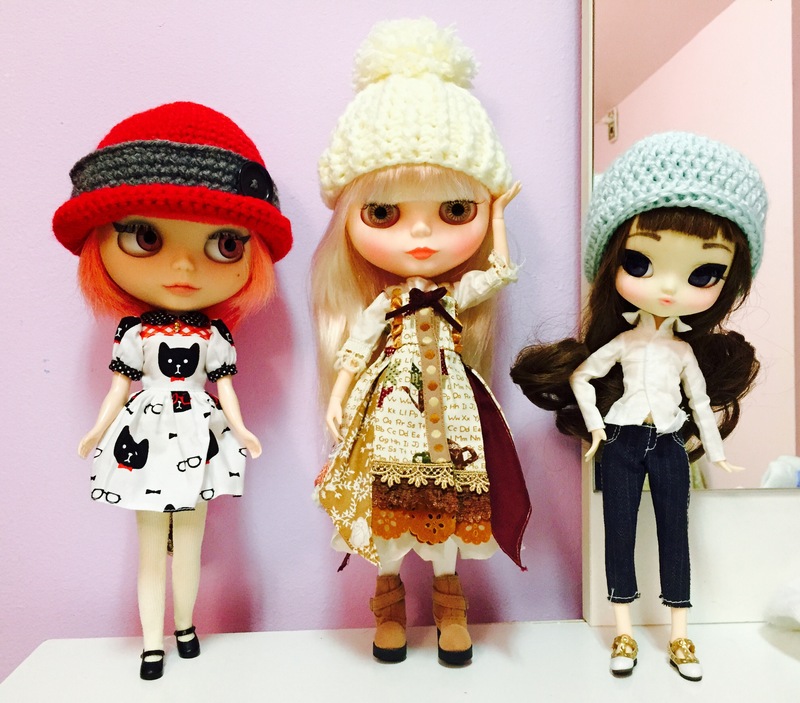 Although there are tons of hat styles for people (newsboy, baseball cap, bucket hat, beanie, tam, beret, skull cap, etc), not all of these have been translated to pattern or scaled down to fit Blythe dolls. 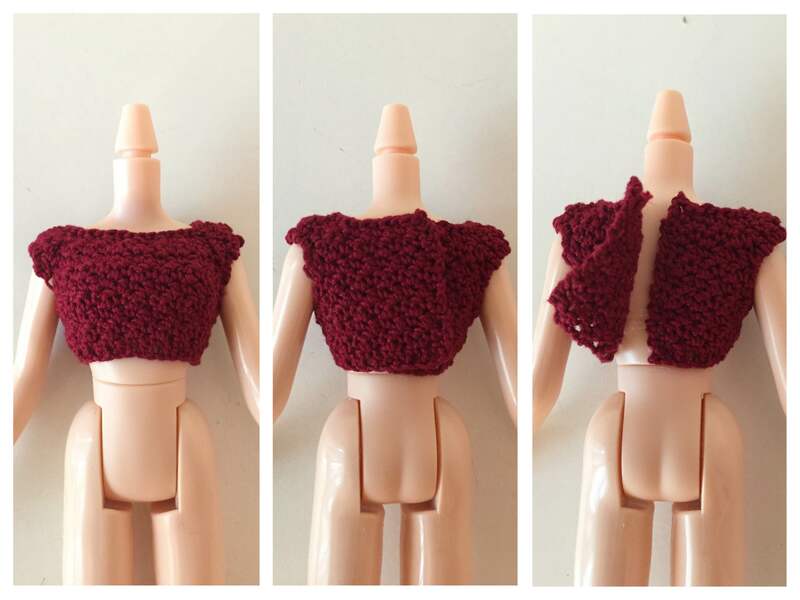 I’m not an expert at crocheting, or pattern adjusting, but I do have a few tips that I think might be helpful for fellow blythe-loving crocheters. Most of my tips will have to do with playing around with gauge. Gauge is usually defined in the pattern by a ratio of stitches and rows to a given measurement such as 16 stitches and 14 rows in single crochet = 4″. You should always work a swatch of fabric (approximately 4″ x 4″) in the stitch pattern of the piece you are making. A pattern will instruct you to use a certain weight of yarn and a specific hook size to achieve a set size for the finished product. 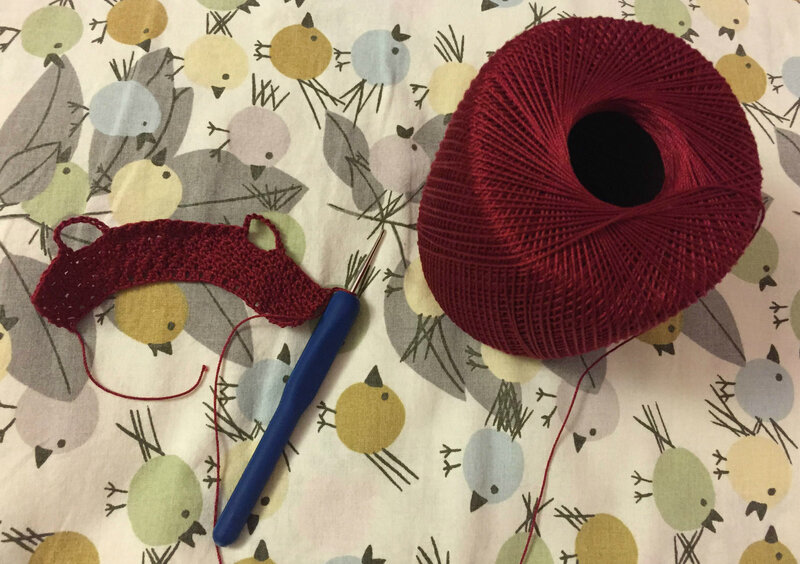 Sometimes, the pattern may recommend the user to create a swatch to make sure the correct gauge is achieved, and if not, the user should adjust their hook or yarn until the recommended gauge can be recreated. Who has time for this??? My approach to achieving the gauge I want is more trial and error and may even cost me more time. Lol. Mostly, if the pattern I am using is for a hat that would be slightly too big for a blythe, I will use a smaller hook, or a smaller hook and slightly thinner yarn, as opposed to adjusting the number of stitches in the pattern. I find this to be more simple than dissecting the pattern and making changes to the stitches and rows. I want to reiterate that this type of adjusting works best on hat patterns that are slightly too big for blythe dolls. I wouldn’t try this on a hat pattern for an adult human, and expect it to fit my blythe doll (at least not without struggling first). I say this with relative certainty, though I believe that the circumference of American Girl doll heads are a bit bigger than Blythe heads. I’ve made several Blythe sized hats for a coworker’s daughter’s American Girl doll, and they fit well. The beauty of crocheted hats is that they have a good deal of stretch to them. When testing an American Girl doll hat pattern to create a Blythe sized hat, I might suggest a slightly smaller hook to achieve a snugger fit. American Girl dolls are more prolific than Blythe dolls in America, and they have a stronger presence in the media, being very popular with kids and adult collectors. There are many hat patterns out there specifically for AG dolls. The two hats on the right were both made from baby hat patterns. The number of baby hat patterns dwarfs the number of Blythe hat patterns, no contest. Of course, a baby’s head will most likely be considerably bigger than a Blythe’s head, so this is where I suggest being experimental with gauge. To be quite honest, using smaller hooks or thinner yarn isn’t a guarantee that the baby hat pattern will translate well as a Blythe hat. I’ve run into quite a few problems with proportions, because let’s face it, I can’t think of any baby whose head is shaped remotely like a Blythe’s head (wide face, yet very flat head…). However, when the hat comes out to be a success, you have a pattern you can add to your repertoire! And, you’re able to add variety to your Blythe doll wardrobe. Note that you may have to do some technical adjusting by shortening the hat (maybe cutting out some repeat rows in the middle of the hat). A Blythe’s head is not as long as a baby’s. Subtopic protip – Preemie hats! Sometimes baby hat patterns will also offer instructions for several sizes. For preemie baby hat patterns, the pattern will often segregate the sizes by baby weight or by head circumference. Blythe dolls would fall into the 3-4lb baby sizing. This takes a lot of the guess work out of making adjustments. By this I mean, have one of your girls handy for intermittent fittings while crocheting. I usually place the would-be hat on my doll’s head after every row past the 4th or 5th row. I can generally tell if a hat is going to be too big, and sometimes I try salvaging my efforts by strategically placing some decreases. Also, the frequent modeling can help with determining hat length. 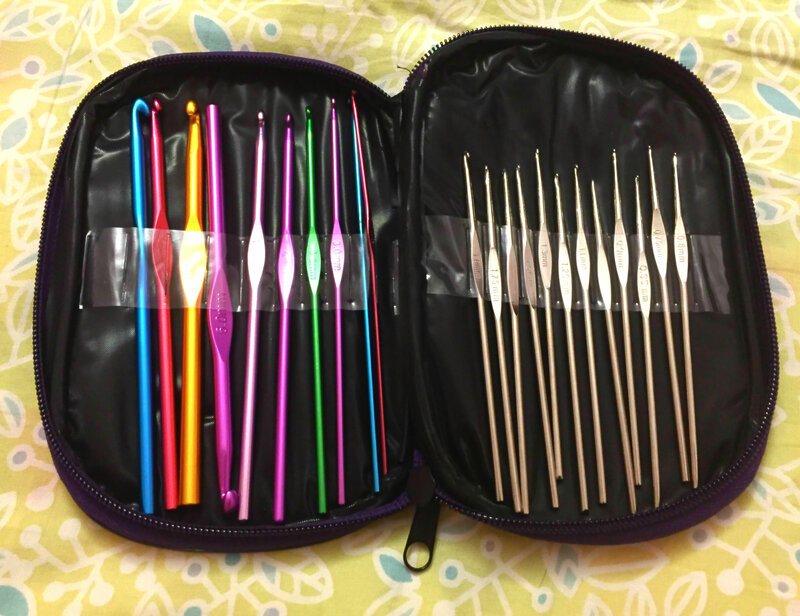 I hope this helps anyone looking to crochet hats for their Blythes. 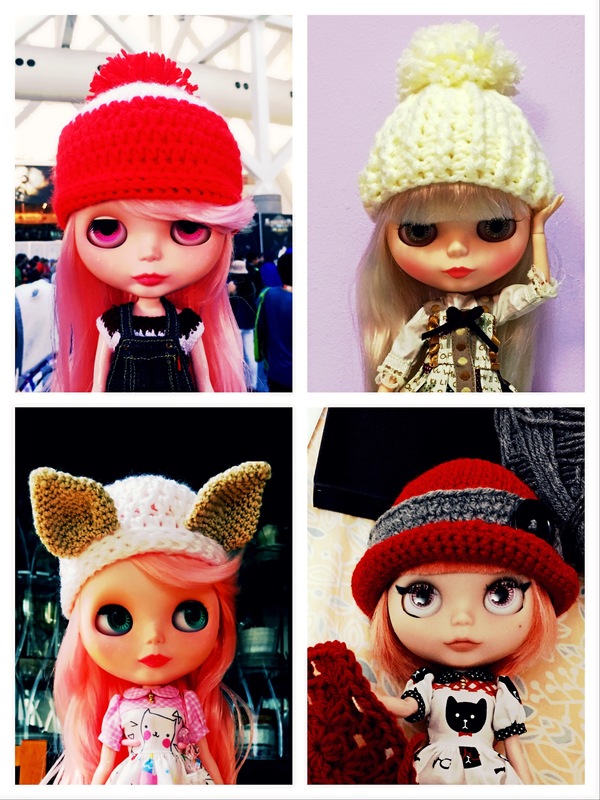 In my opinion, Blythe dolls’ heads are practically made for hats with how oversized they are compared to their bodies. Crocheting for my dolls is a big part of how I enjoy this hobby, and I know how frustrating it is to have limited pattern resources. In all honesty, it would probably be faster to just sew this top using fabric and thread. But if you’re like me, and you can’t sew to save your life, here is a pattern I drafted for a very basic boat neck top. This is the first pattern I’ve ever posted anywhere publicly! Hopefully it’s easy to follow (and if not, please don’t hesitate to ask for clarification). You can make the top longer by repeating row 2. You can use this piece as the top of a dress by sewing a skirt to it or crocheting a separate skirt and whip stitching the two pieces together. You can add sleeves or picots to the arm holes. You can add scallop edging. Griddle Stitch – This is the name of the stitch I am predominantly using. To create the griddle stitch, simply alternate between sc and dc. On the following row, alternate between sc and dc, making sure to sc in a stitch that was a dc in the previous row, and vice versa. It’s easier if you work with an even number of stitches, that way you will always start with a sc and end with a dc. In this pattern, every row begins with a sc and ends with a dc. Always chain 1 and turn at the end of each row. I like making one back piece longer than the other, that way I create an allowance area to sew snaps. I am kind of partial to using the griddle stitch because the rows aren’t so apparent when the top is complete. This stitch also gives the piece an interesting texture. This pattern looks ginormous, but it’s only 9 rows! Chain 10 (back) + 4 (side) + 12 (Front) + 4 (side) + 8 (back) (38 stitches). Chain 1 and turn. Row 1: (sc, dc) x 19 (38 stitches). Chain 1 and turn. Row 2: Griddle stitch to end of row (38 stitches). Chain 1 and turn. Row 3: (sc, dc) until stitch #10. dc increase in stitch 10. (sc, dc) until stitch #15. sc increase in stitch #15. (dc, sc) until stitch #26. dc in stitch #26. (sc, dc) until stitch #31. sc increase in stitch #31. (dc, sc) to end of row. (42 stitches). Chain 1 turn. Row 4: Griddle stitch to end of row (42 stitches). Chain 1 and turn. Note: If you’re not sure if you’ve used the correct stitch to make the griddle stitch pattern, it’s alright. The beauty of this stitch I find is that it’s quite forgiving, so long as it’s only a few stitches that do not correctly alternate between rows. Row 5: Griddle stitch until stitch #10. dc increase in stitch #10. Griddle stitch until stitch #16. sc increase in stitch #16. Griddle stitch until stitch #25. sc increase in stitch #25. Griddle Stitch until stitch #31. dc increase in stitch #31. Griddle stitch until end of row (46 stitches). Chain 1 and turn. Row 6: Griddle stitch until stitch #9. Chain 10 and skip 4 stitches. Griddle stitch starting from stitch #13 until stitch #32. Chain 10 and skip 4 stitches. Griddle stitch until the end of the row. Chain 1 and turn. Row 7: Griddle stitch until stitch #10. dc decrease in stitch #10 and into the 10 chain. (sc, dc) x 4 into the chain. sc decrease into the 10 chain and into stitch #15. Griddle stitch until you reach the other 10 chain.Repeat the dc decrease, (sc, dc) x 4, sc decrease to the other 10 chain. Griddle stitch to the end of the row. Chain 1 and turn. 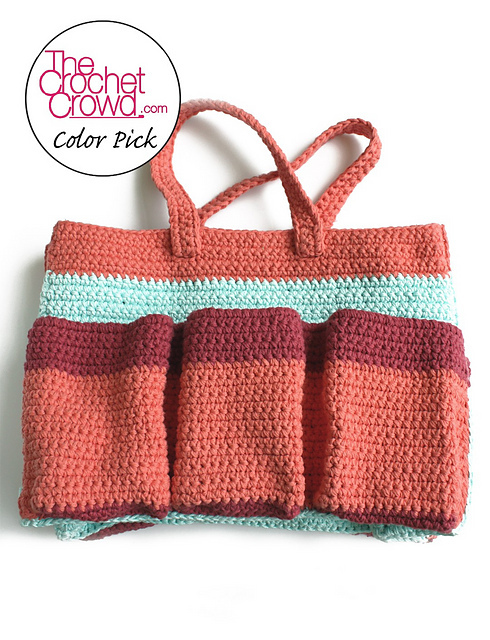 Row 8: Griddle stitch is used for the entire row, save when you insert a decrease. Insert decreases before and after the start of a sleeve (the hole formed by the 10 chain in row 6), at the very top of the sleeve, and the center of the chest. Chain 1 and turn. I made a visual pattern! Please do not sell this pattern or claim this pattern as your own. Feel free to sell items made using this pattern or share this pattern on your own blog, but please make sure to credit me and my blog. Thank you!